Margarita shrimp must have been invented by a margarita and shrimp lover, Put the two together and you’ve got the “wow” factor. If you have never tried this you are in for a delicious surprise. The tequila, triple sec and lime juice combined with garlic and onion creates some wonderful flavors to marinate the shrimp in. I’ve added a little orange juice and some coconut milk to round out the flavors. Your first bite will have you thinking margaritas and then the smokey grilled bbq flavor sneaks in making this lip smacking delicious. You will be back for more as this is irresistible. This marinated grilled shrimp recipe makes a perfect appetizer or main dish served over cilantro lime rice or pasta. It’s very easy to prepare and everyone loves it. You can also watch my How To Make Margarita Shrimp video on YouTube. This opens in another window. Defrost the shrimp if you have frozen shrimp. I place them in a colander while I mix up the marinade. Soak the bamboo skewers in a container of water for at least 20 minutes. This will keep the skewers from catching on fire on the bbq. Mix all the ingredients in a bowl except for the coconut milk. Add the shrimp and make sure they are covered by the marinade. Cover and place in the refrigerator for an hour. Place the shrimp on the skewers so that they are attached in two places forming a “C” shape. You can probably put 3 to 4 shrimp on one skewer. You must keep the marinade refrigerated right after you skewer and grill the shrimp. Fire up your bbq and clean off the grate. Brush olive oil over the grates. I like to cook the shrimp over pretty high heat with the lid open. Be careful not to over cook the shrimp. They will turn rubbery and dried out. With the bbq on high, lay the shrimp on the grill and leave the lid open. This will allow you to keep your eye on the shrimp and keep them from over cooking. The high heat will allow you to put those appetizing grill marks on the shrimp. Turn the shrimp over after 1 1/2 to 2 minutes. Cook another minute and a half and, the shrimp will be done and pink in color. Now make the dipping sauce. Pour the remaining marinade into a frying and pan and bring to a rolling boil. Add the coconut milk and simmer on low for 6 or 7 minutes. 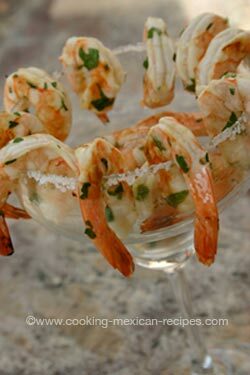 Margarita shrimp can be served as an appetizer garnished with lime wedges and parsley. The cooked marinade can be used as dipping sauce (it taste delicious), or you can use the marinade as additional sauce, served over rice or pasta. Now all you need is a margarita to go along with the shrimp! Find More Mexican Appetizers here.